Home. It's a funny thing. As a kid, I was running as far away from home and rural Idaho as I could get. I saw myself walking down city streets, catching public transportation, and having a way cool job. Which I do, or did, for five years. I'm Angie Turner former chef of el pescado located in San Francisco and formerly, formerly a resident of River Vista, Idaho. Before my folks died, I lived in Colorado, but most of my childhood memories are from my Nona's home outside River Vista. She left me the farm in the will. And her favorite hen, Mabel. Of course, Mabel thinks she's letting me stay in the house. Payment, I guess for feeding her twice a day as well as keeping her in fresh water. Other than that, she had no use for me. I started a huge garden, mostly so I'd be sure to have the fresh herbs and vegetables I want for my restaurant, the County Seat. It opens soon and I keep wondering if I'd made a terrible mistake and convinced my best friend to move back here and help my with the restaurant. Maybe it's just opening night jitters, but I'm as nervous as a cat on an old tin roof. We open in less than three weeks and I don't have all my suppliers lined up yet. I guess I better sign off here and go find the local farmers market. That should give me the supplies I need while I cultivate relationships. And when I went looking for a dog, since I'm not living in an apartment anymore, I went overboard. I got a St. Bernard puppy. Dom's cute and cuddly now, but soon, he'll be too big for my SUV or the dog bed I bought. Am I home? It feels like it. Now, I just have to get over the hurdle of dealing with the people and the past I ran away from years ago. Good thing I have a friend like Felicia. See you soon at the County Seat. 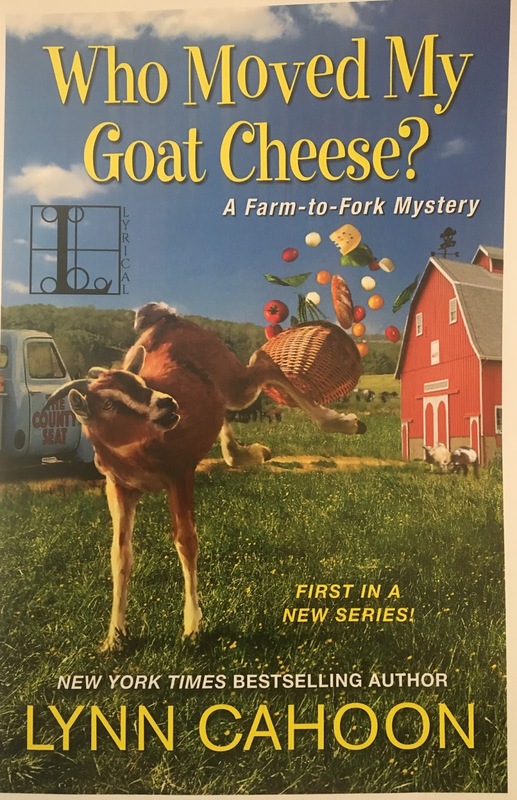 WHO MOVED MY GOAT CHEESE is releasing March 6th and available for pre-order in digital, print, and audio. Find out more at the author's website. I won’t an advanced copy on Goodreads. I’m about halfway through and am enjoying it. 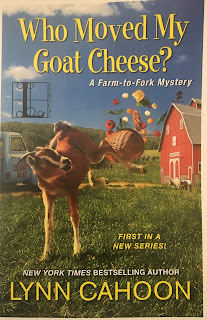 Can't wait to read WHO MOVED MY GOAT CHEESE! While I've never had goat cheese, I've had many friends and relatives ask me why I never took over the restaurant in a building my grandmother owned. I was young, stupid and did NOT want to be up at zero dark thirty to make sure the food stuffs being delivered were up to my standards. Yeah, that's the reason and I'm stickin' with it. St. Bernards are adorable & yes, huge. Looking forward to reading this. Yes, St. Bernards are huge but cute. I’m liking this book already and I just read your introduction! We have one hen, too...named Mabel! My son-in-law thinks it’s a hoot that she has a name. She had a coop sister, Gladys, who has moved on to be a forever free range chicken. Will look for the book. Thanks!